Vast inflows of donor cash, intended to bring about reconstruction, may instead have added significantly to Afghanistan’s corruption problems. The US has provided $126 billion in reconstruction funding to Afghanistan, but corruption continues to undermine many US projects and programs. Afghanistan is a cesspool of corruption and the provision of billions of dollars by foreign donor agencies to the Afghan government is enriching a few at the expense of the many. The World Bank’s anti-corruption commitment is undermined by some of its operational projects and programs in developing countries. Some of the World Bank’s problems stem from providing funds to programs in areas where the security dangers are so high that on-the-ground inspections are not possible. U.S. government investigators have found far-reaching mismanagement by the World Bank in its capacity as the administrator of the largest multi-country official fund to assist the Afghan government with its social expenditures and to reconstruct the country. A report to the U.S. Congress, issued by the U.S. Special Inspector General for Afghan Reconstruction (SIGAR), found that billions of dollars held in the Afghan Reconstruction Trust Fund (ARTF), administered by the World Bank, are at risk. Afghanistan Reconstruction Trust Fund (ARTF). 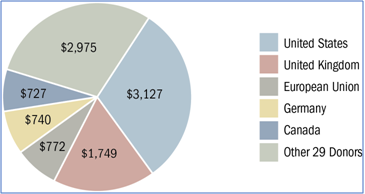 Donor Contributions Paid into the ARTF from 2002 to 2017 (in Millions). Source: Office of the U.S. Special Inspector General for Afghan Reconstruction (SIGAR) analysis of World Bank data. The detailed report stresses inadequate project monitoring, poor information on programs to donor governments, often inadequate project evaluation reports and a host of other failings. The SIGAR report also raises questions about both the World Bank’s management, especially in a war-riven country that is among the most corrupt in the world. This also has bearings on broader issues and policy approaches to development in countries in conflict. The United States has provided $126 billion in reconstruction funding to Afghanistan. As SIGAR reports indicate, including its most recent quarterly report to the Congress, corruption continues to undermine many U.S. projects and programs. Indeed, SIGAR has previously suggested that the vast inflows of donor cash may have added to the nation’s corruption problems. An independent evaluation of the ARTF last year by U.S. AID, the largest single donor, was not only highly critical of the World Bank, but also of U.S. AID officials for not monitoring the Bank’s work far more closely in the past. Some of the Bank’s problems stem from providing funds to programs in areas where the security dangers are so high that on-the-ground inspections are not possible. For that reason, it is for example not clear whether funds have gone to real or to “ghost” teachers in schools that the Afghan Reconstruction Trust Fund has supported. The World Bank has been given the opportunity to review the report and its response is largely defensive. At one point, it says it provides donors with all information on its ARTF work except where such information is restricted by Bank policies. This kind of “Kafkaesk” language only serves to damage the Bank’s image further. While this report is important and will no doubt influence views in the U.S. Congress about the World Bank, which needs Congressional approval for its funding, the response is signed solely by the resident World Bank country director in Kabul – not by the Bank’s president Jim Kim. He has too often stood aloof from the anti-corruption work that, in his public speeches, he claims is a Bank priority. To be sure, the World Bank’s Integrity Vice Presidency does excellent work seeking to curb abuse in procurement, while its Governance Department has been effective in strengthening policies and anti-corruption knowledge. Nevertheless, the World Bank’s anti-corruption commitment is undermined by some of its operational projects and programs in developing countries. The new SIGAR report should prompt Jim Kim to launch a major internal review of its management effectiveness in countries in conflict and in post-conflict with particular emphasis on curbing corruption. International donors who have provided around $10 billion to the ARTF over the years are also to blame. They have not supervised the World Bank’s work sufficiently. And they have failed to ask the basic question: Is there any point to provide the ARTF with more cash? Afghanistan is a cesspool of corruption and the provision of billions of dollars by foreign donor agencies to the Afghan government is enriching a few at the expense of the many. The World Bank, U.S. AID and other official donors have repeatedly ignored the lessons of the missing billions of dollars of funds in the country. “Escaping the Fragility Trap,” is a new report by the LSE-Oxford Commission on State Fragility, Growth and Development, an international commission including former UK Prime Minister David Cameron, with the research directed by UK scholar Sir Paul Collier. •	involving citizens fully in all aspects of reconstruction and development. Citizen engagement in the planning, the disbursement of funds and their monitoring and evaluation has not been the way chosen by most international donors. Rather, as in the case of the World Bank and ARTF, they rely too heavily on international consultants. That is the wrong course. Collier and others have been saying this for years. Now SIGAR is calling on the World Bank to reform. The Bank’s response so far is bureaucratic and in a country like Afghanistan that may amount to more wasted aid funds. It is time World Bank chief Kim engaged and challenged international donors and his own staff to comprehensively rethink the role of aid in fragile states. There is no better starting point than the findings of the commission on development approaches in fragile states.